A while ago, a friend told me about the Midlands Blog Meet that was happening locally. 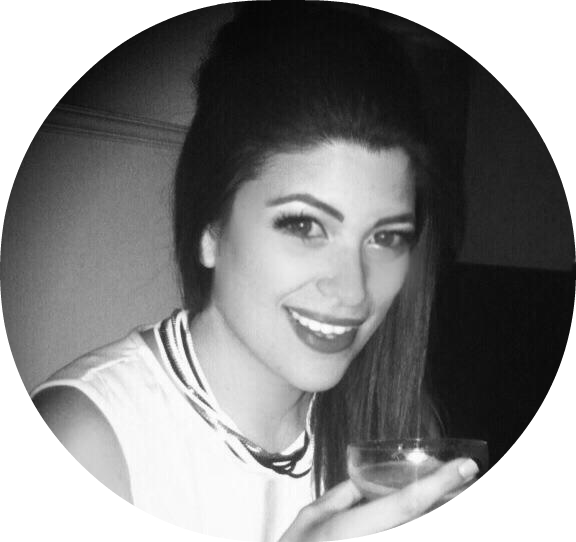 As you may know, its only recently that I've come out of the closet about blogging, and since then I've made some wonderful discoveries and have been enjoying it more than ever. I don't know what took me so long! Seeing as the spirit of adventure had got me going, after a lot of nerves, I emailed the organisers to see if there were any spaces left. The email I got back from Emma was so lovely that it really encouraged me, so I found myself on a bright Saturday morning toddling along to the Malt Cross. It's an old Victorian music hall that now operates as a cool cafe-bar, a perfect venue for what turned out to be an extremely relaxed and very fun day. I was still really nervous but as soon as the organisers, Emma and Kelly, said hi with their beaming smiles, I began to relax. Soon found myself sat with the most lovely group of ladies, chatting away. Although we ranged quite a lot in subject, and how professional we were, I was surprised how many said that, like me, they've kept their blogs quiet, especially from family and friends. I had an amazing day, so much nicer and less nerve-wracking than I thought. And I met some genuinely great people - Laura from Unloved Button, Cate from Me Add Three, Samantha from Create It Samantha ,Lauren from Life of Miley, Iris from Baked By Me, Ellie from The Mummy Diary, Sally from RainyDayFaces and Amanda from Amanda in a Teacup were people I spent particular time getting to know. Everyone was really welcoming and it truly was a great event - so nice to meet other people interested in the same things. 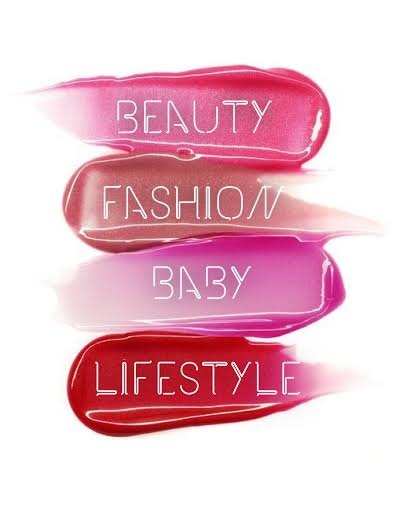 Some of us are already talking about forming the Nottingham 'Makeup Mafia', which could be really exciting. After lunch, there was a brilliant surprise waiting for us - Sophie and Autumn from The Body Shop, who had come down to show us all the great new products on offer. I was in there like a ferret down a rabbit hole! 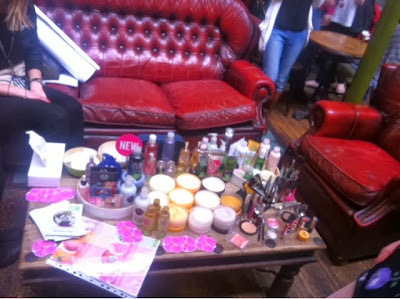 Loved seeing all their great products and learning more about The Body Shop. Look at all that beauty booty! I actually haven't been in The Body Shop since I was a young teenager, but there were a couple of new hero products I'd started to hear about on the grapevine that I'd been wanting to try. 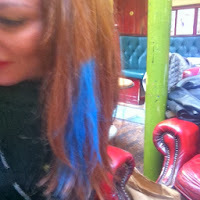 These hair chalks are a brand new launch, Having wild coloured locks that wash out for festivals and big events is something we see on the likes of Alexa and Daisy all the time. You don't have to reach for the dye anymore with new products like this. However, I sort of assumed that they wouldn't work very well for dark haired girls like me, but guess what? We tried them out and they're really bright and vivid! This product also stood out as something I'd want to try - it's a 2 in 1 'Serum in Oil' for use at night. It's packed with Vitamin E to help your skin replenish itself and soak up moisture while you're sleeping. I use an oil at night and serum separately at the moment, so this seems like a time saver to me. 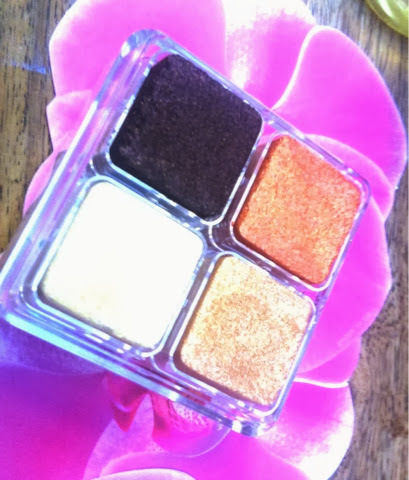 These Shimmer Cubes eyeshadows made a real impression on the girls there. I can only describe them as little shimmering cubes of loveliness. They're vividly pigmented and very high-shine, so they'd look amazing on a night out. 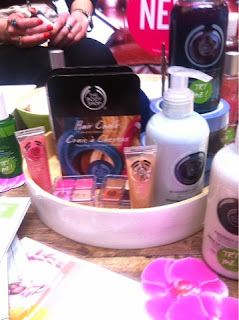 This gel bronzer from their Honey Bronze range also caught my eye, big time! 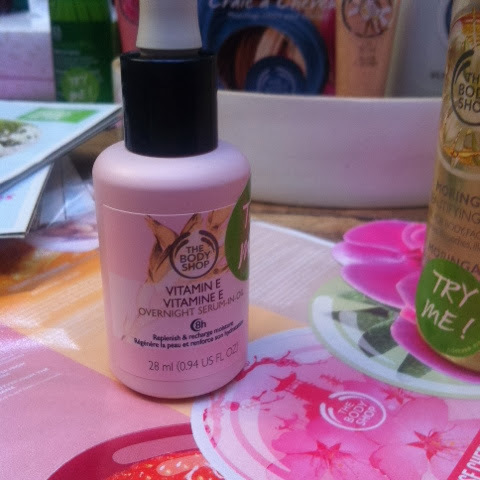 You can mix it into your foundation or moisturiser to give yourself a warm glow. I think I would just use it to contour my face on a brush, because it has real staying power. 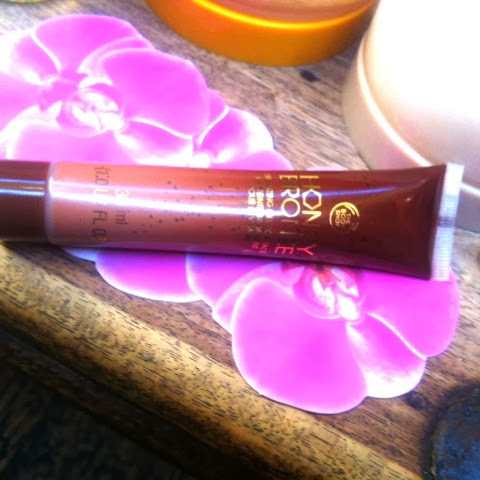 It would also be great to take on holiday, when your foundation ends up a bit too pale when you've been in the sun! This was the product I'd been looking forward to trying ever since reading a review of it on the blogs of our hosts for the day! It's a wonder oil that has about a million different uses and comes in so many different scents. I was actually planning on picking one up on payday, so it was really good to get to try them. The Moringa one was especially delicious. At the end of a great day, I was lucky enough to win a prize as well as a goody bag. I never win anything so I was a bit slow on the uptake when my name was called. I got a fabulous basket full of goodies, and Sally very kindly gave me a lift home otherwise I don't know how all that stuff would have made it back! Just look at it all! Yummy mummy goodies - A signed copy of 'What to Expect When You're Expecting', the matching DVD and a pregnancy workout DVD, a really cute cover-all bib with little space rockets on (Awww! ), a Tommy Tippee cup, teething jewellery and a batik painting set. This isn't as wasted on me as you might think - once we've moved house, I'm sure trying to start a family will be quite high on the agenda, so I'm saving these for now, apart from the Batik set which I thought would be fun to do with my little niece, Annabel. I've had to stash these in the loft though, in case the family catch sight of them and think I'm not telling them something! Lovely baking goodies from Iris of Baked By Me - check out how cute the cookie making set is in the kilner jar - wouldn't that make the loveliest present? I will be doing some baking next weekend with these. Weleda goodies - it's not a brand I've ever tried before, although of course I've heard of its cult Skin Food cream, which is a beauty editors favourite.There was also some of the Calendula Cream, the Wild Rose body wash and Wheat Balancing Shampoo, as well as sachets of the Oat Replenishing Shampoo and Conditioner. 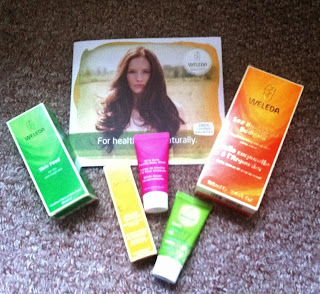 I also got a huge bottle of the Sea Buckthorn Body Oil, so I'm really excited to try those and will no doubt be doing a Weleda themed post shortly! 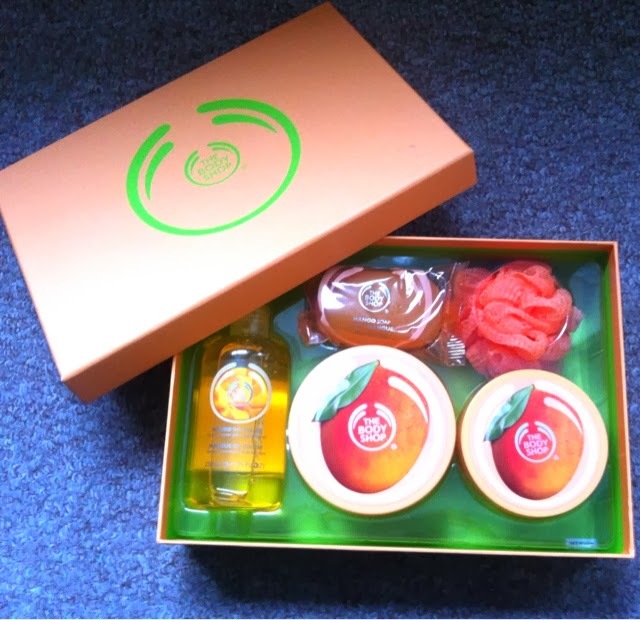 A beautiful Mango Gift Set from The Body Shop, with a cute shower pouffe, a soap, a shower gel and big tubs of the legendary Body Scrub and Body Butter. I can't wait to try these and will certainly be smelling sweet for spring! I also got a special discount card to use on more goodies, which was handy because I trotted straight down there with some of the other girls afterwards to pick up some of the items we'd been admiring! I was a really lucky girl and it was like Christmas when I got in! Can't believe what a lovely time I had. It was something special to meet everyone and hopefully have made some blogging pals. My other friends mostly moved away from where I live after uni, so it would be great to know some more people locally, especially ones that are equally as obsessed with beauty stuff. Big thanks to Kelly and Emma for organising such a great day for us all. It was great to meet you at the event, and I love your blog! Hope to see you again soon, and now following on Bloglovin'. Oooh, thank you Cate, much appreciated! Really great to meet you too. I feel like I have 'love tourettes' I've said how lovely it all was so much, to anyone who would listen!